Download The Much Anticipated Debut Singles "Mighty God" by D-Sammyst. The Multi Talented Gospel Music Minister Inspired by The Messages Of Pastor Chris Oyakhilome Is On A Mission To Take The Divine Presence Of The Lord To The World Around Him Through His Music. Through His Music, Jesus Will Be Preached To The World and Many Will Be Turned From Darkness Into Light. God's Praise Oracle as He is Also Called; D-Sammyst Is A Very Passionate Praise Worship Leader, A Lover Of God Like Never Seen. 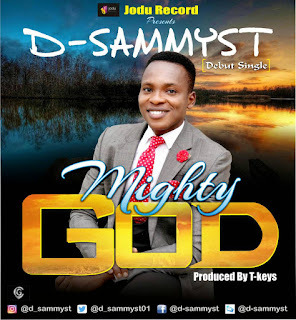 D-Sammyst Has Shared The Stage With Great Gospel Music Ministers Like Eben, Samsong, Joe Praise, TB1, Pee Yuu, Sophiya and Many Other Gospel Greats of Our Time. This Song "Mighty God" Will Make You Worship The Great and Mighty God.